The average cost of memory care in Highlands County is $2,187 per month. This is lower than the national median of $4,650. Caring.com has helped thousands of families find high-quality senior care. To speak with one of our Family Advisors about memory care options and costs in Highlands County, call (855) 863-8283. Highlands County sits in the center of the Florida panhandle, northeast of Ft. Myers, with a population of 102,884, 34.8 percent of whom are age 65 or older. Among that group, an estimated 13 percent, or 4,500 people, are living with Alzheimer's disease and would benefit from care in an assisted living home that specializes in treating patients with dementia. 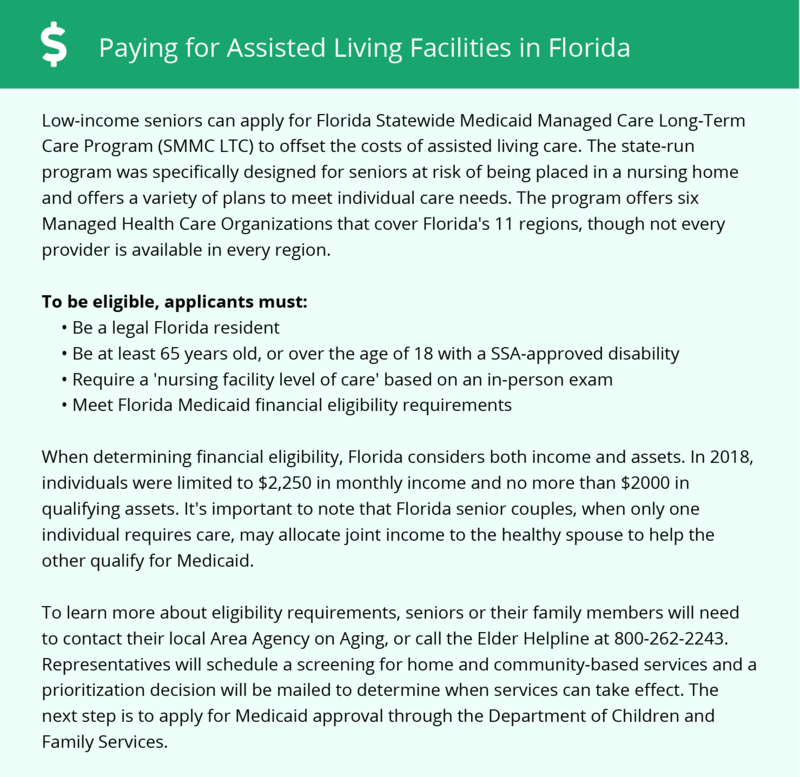 To become Extended Congregate Care Facilities (ECCs), assisted living facilities must be licensed by the governing body, the Florida Agency for Health Care Administration, which establishes the regulations and inspects the EECs. Highlands County has two of these ECCs in the town of Lake Placid. Seniors and family members on a fixed income may discover that their budgets stretch farther in Highlands County because the state has no income tax. That excess money can be spent on healthcare costs in an ECC. Based on a U.S. median of 100 across all categories, cost of living ratings in Highlands County's is 89.3. Housing is very low at 68, and healthcare rates are only 9 points above the median. The savings on housing and taxes can make a considerable difference when budgeting for an ECC. Snow never falls in Highlands County, but it does receive 50 inches of rain per year, which is 11 points more than an average U.S. city at 39. The national average of 205 sunny days annually is almost 50 lower than Highlands County's average of 253. Seniors' health may benefit from the balmy weather. Winter lows only fall to 48 degrees, and summer highs reach 92. Highlands County received a 75 out of 100 in Sperling's Comfort Index. Highlands County is home to world-class medical facilities, including those specializing in brain health and dementia care, such as Highlands Regional Medical Center and Advent Health Sebring, in the event of a medical emergency or illness. Memory Care costs in Highlands County start around $2,187 per month on average, while the nationwide average cost of memory care is $4,781 per month. It’s important to note that memory care rates in Highlands County and the surrounding suburbs can vary widely based on factors such as location, the level of care needed, apartment size and the types of amenities offered at each community. Highlands County and the surrounding area are home to numerous government agencies and non-profit organizations offering help for seniors searching for or currently residing in an assisted living community. These organizations can also provide assistance in a number of other eldercare services such as geriatric care management, elder law advice, estate planning, finding home care and health and wellness programs. To see a list of free memory care resources in Highlands County, please visit our Assisted Living in Florida page. Highlands County-area assisted living communities must adhere to the comprehensive set of state laws and regulations that all assisted living communities in Florida are required to follow. Visit our Memory Care in Florida page for more information about these laws.